A leftist protest in Sevastopol. Photo: Ivan Zhilin / Novaya Gazeta. This article originally appeared in Novaya Gazeta. We translate it here. Most news on political repression in Crimea concern FSB raids on Crimean Tatars or pro-Ukrainian activists. But other opposition activists aren’t exempt from the security services’ attention either. As I found out, people who aren’t against Russia, but do oppose the ruling United Russia party are on the receiving end of no less harsh treatment, albeit more rarely. On 1 March 2018, police and FSB operatives in Sevastopol conducted a raid against an anarchist group in the city. They searched the apartments of Alexey Prisyazhnyuk, Artem Vorobyev, Igor Panyuta, Alexey Shestakovich and Ivan Markov. “According to available information, the aforementioned group of people planned provocative protests during the Russian presidential election scheduled for 18 March 2018. This anarchist cell maintains connections with other left-wing radical organisations active in Russia,” this is how media in Sevastopol explained the security services’ actions. 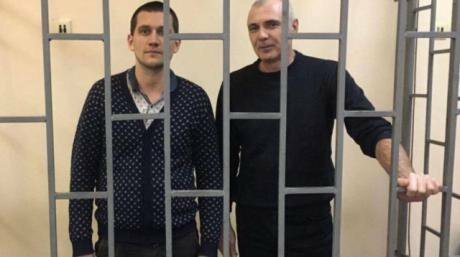 Alexey Shestakovich and Ivan Markov were sentenced to 11 and 10 days in jail respectively. They were found guilty of producing and disseminating “extremist material” (Article 20.29 of Russia's Administrative Code). Other activists were not arrested, and were not charged. Three days before the searches, Alexey Shestakovich posted a document in the “Anarchists of Sevastopol” group on Russian social network VKontakte. This was a notification filed to the authorities regarding his intention to hold a rally on 10 March at Admiral Ushakov square in central Sevastopol. The rally would be held under the slogan “The position of president is a relic of the monarchy”. The notification was addressed to Sevastopol governor Dmitry Ovsyannikov. The stated goal of the protest was “to remind citizens of their constitutional right not to vote in elections”. The searches at all the activists’ homes started simultaneously, at 7.30 AM. Alexey Shestakovich was treated more harshly. “The (security service) operatives came around 7.30,” says Alexey's mother Lyubov Shestakovich. The people who were not arrested were, however, questioned as witnesses in a criminal case opened against their comrade Yevgeny Karakashev. 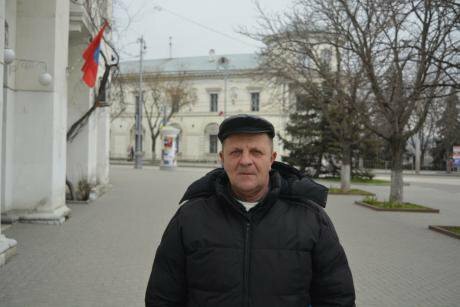 Karakashev was arrested on 1 February 2018 in the Crimea town of Yevpatoria. He was immediately charged with breaking two articles of Russia’s Criminal Code: Part One of Article 282 (inciting hatred or animosity) and Part Two of Article 205.2 (calls to a commit terrorist acts). According to investigators, it was two posts that Karakashev made on VKontakte in 2014 and 2017 which broke the law. According to the indictment against Karakashev, investigators identified a “call for terrorism” in a “teletext starting with the words ‘use a grenade against’ and ending with ‘into government offices’ windows’”. The extremism charge was related to Karakashev sharing a clip called “Last interview of the Primorye Partisans” (more on this group here), a video deemed extremist and banned in Russia, in a chat with 35 members. The arrest of Yevgeny Karakashev. Screenshot from a security service video.The security service video of Karakashev’s arrest shows that he had been severely beaten. “During the physical examination, the following physical injuries were found: a bruise on the right side of the forehead, 6x8cm in size, a bruise on the right ear, a bruise on the right shoulder 7x7cm in size, a bruise on the right pectus 3x12 cm in size, a bruise on the back, bruises on the knees, a bruise on the right shin,” wrote medical personnel at the pre-trial detention centre. However, no criminal case was opened over the beating. “On 1 February, 2018, E.V. Karakashev filed a request not to investigate the physical damages he had sustained,” says the decision not to open a criminal case, signed by both a district police inspector and district head officer in Yevpatoriya. Four months before the searches at the homes of Sevastopol anarchists, the security services raided Valeriy Bolshakov, leader of the Sevastopol branch of Rot Front communist party. Valeriy Bolshakov. Photo: Ivan Zhilin / Novaya Gazeta.“They came at six in the morning. First I heard a knock on the door. They shouted: ‘Open up!’ I thought these were some kind of hooligans. I told them: ‘Piss off!’ Then they said: ‘Your pipes are leaking, you are drenching your neighbours!’ I went to the bathroom, and it was dry. I shouted back at them: ‘Get lost!’ Then it was quiet for half a minute... and that's when I heard the cutter tool. The door was pushed open and masked men barged in. Right away, one of them hit me near the heart with a rifle stock, dropped me to the floor,” Bolshakov recalls. A court ruling on a search under a criminal case over “inciting hatred or animosity” (Article 282 of Russia’s Criminal Code) was read out to Bolshakov. In late May 2015, Bolshakov recalls, he was walking along Sevastopol’s Istorichesky boulevard, five Cossacks in traditional hats and leather kilts were walking towards him in the opposite direction. “I burst into laughter when I saw them. I mean, what kind of reenactor fair is this? But when I laughed, they approached me and threatened to beat me up. When I got back home that day, I wrote on VK: ‘A group of battle f****ts disguised as Terek Cossacks is roaming Sevastopol.’’ This was the pretext for opening a criminal case. During the search, agents seized not only electronic devices, but also party documents from Bolshakov. “During the interrogation at the Investigation Committee, they barely touched upon the Cossacks. They mostly asked me who the people who attended Rot Front rallies were, who were the party’s members and what were its goals. To all the questions I answered that I wasn't going to rat out anyone,” Valeriy recalls. Aksenov’s words were prompted by a rally held in the town of Alushta against local authorities’ construction policies and limiting locals’ access to beaches. 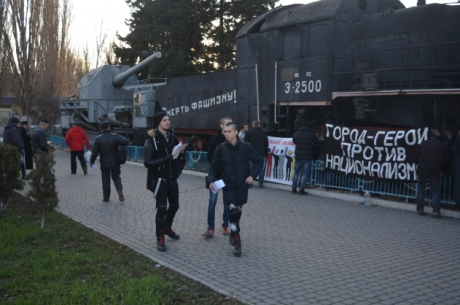 The rally, which saw the first clashes with police in Crimea since spring 2014, was organised by Alushta city councilman Pavel Stepanchenko, a member of the Communist Party of the Russian Federation (KPRF). During Russia’s September 2016 parliamentary election, Stepanchenko crossed the authorities again: he uncovered forged documents which led to KPRF members being barred from electoral commissions (which typically include representatives from all establishment parties, including official opposition). Two weeks later, on 4 October 2016, Stepanchenko was arrested. Pavel Stepanchenko and Alexey Nazimov.Alongside Stepanchenko, the security services also seized Alexey Nazimov, the editor-in-chief of Alushta's local paper Tvoya Gazeta (“Your Paper”) and Andrey Oblezov, a cameraman. First, these men were accused of commercial bribery, and then of attempting to extort money from the ex-secretary of Alushta city council Mikhail Krasnenkov and businessman Aleksandr Ryzhkov (an aide to the Alushta council United Russia faction leader Dzhamal Dzhangobegov). According to the investigators, Nazimov, Stenanchenko and Oblezov demanded that the United Russia officials pay them 150,000 roubles in return for them not publishing compromising materials. The accused, in turn, claim they made no such demands and didn’t have any compromising material either. “Moreover, Krasnenkov was actively seeking for a pretext to give them money,” says Nazimov’s lawyer Alexey Ladin. In a letter to Novaya Gazeta, Alexey Nazimov wrote that by summer 2016, the situation in Alushta was tense. After the anti-construction protest that made national headlines, city council sessions turned into heated arguments. In early July, Krasnenkov called Nazimov. Stepanchenko told a similar story in his letter to Novaya Gazeta. Alushta mayor Galina Ognyeva, a witness in the case, told the court that Nazimov “criticised the authorities the wrong way” and thus, she believes, broke the law. “The journalist could have settled the problematic issues with me and corrected his reporting,” she said in court. 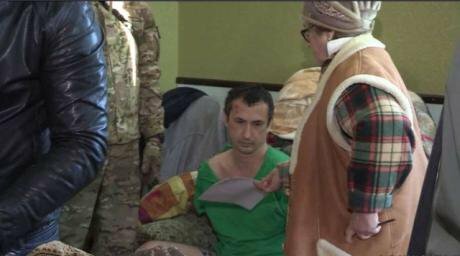 During one of the hearings, Pavel Stepanchenko complained he’d been beaten in pre-trial detention. According to the council deputy, physical force was used against him after he asked to call a doctor. The investigative authorities found no grounds to open a criminal case over Stepanchenko’s complaint.